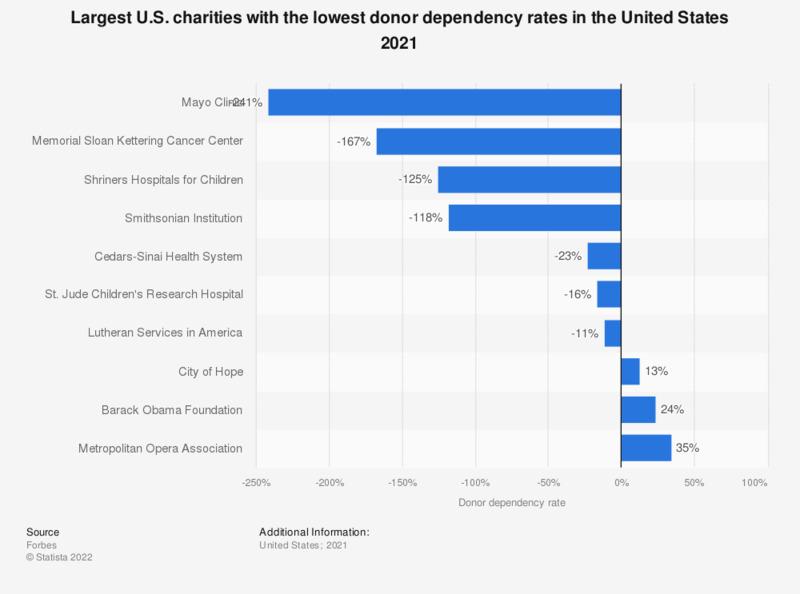 This statistic shows the U.S. charities (out of the 100 largest) that were the least dependent on donor contributions as of 2018. City of Hope had the lowest rate of dependency on its donors with a score of -163 percent as of 2018. A score of 100 percent would signify that the charity had broken even in its budget. A minus score signifies a budget surplus. To calculate donor dependency rates the annual budget surplus/deficit was subtracted from the total amount in gifts and then divided by the amount received in gifts. The higher the score, the more a charity was dependent on donor contributions. A score of 100 percent would signify that the charity had broken even in its budget and a score lower than 100 percent shows that the charity ran a surplus. *Only the 100 largest charities are included in this list.